We have several good friends getting married this fall and winter, and we're going to be busy celebrating their upcoming marriages with lots of fun parties. Here we are in Greenwood about to go to a party for Sparky and Jenny Kate!! We loaded up the RV and headed to Starkville last Friday for the 1st football game. It was a CRAZY weekend, to put it mildly, but Mary Mason had a blast. I now know that Stratton is still a little too young to enjoy himself. There was so much going on, and Mary Mason was not in a picture taking mood, so this was the only shot I got. I took Mary Mason on her 1st trip to the zoo last week. She had such a good time, except her almost 3 year old attention span really showed. She would be so excited to see the animals, and when we got to them about 5 or 10 seconds would go by and she would say, "Ok, let's go see something else." The weather was perfect, and Aunt Me came and met us. I can't wait to take her back again! 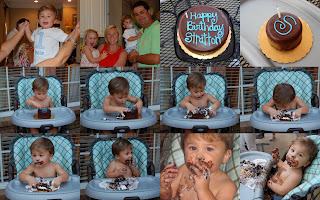 I took Stratton to the doctor Wednesday for his 1 year old shots and checkup. He's doing GREAT!!! 23 lbs and 29 inches + 16 teeth!!!! We go back in 3 more months for another checkup. I can't wait to see how much he grows. Sorry, no pictures, I forgot to take my camera. he REALLY enjoyed his ice cream cake!! !